American astronauts could be forced to fly on Russian spacecraft beyond 2017 if Congress continues to cut funding for private crewed vehicles, NASA chief Charles Bolden says. On Tuesday (April 30), NASA announced that it will pay $70.7 million each for six more seats aboard Russian Soyuz space capsules. The $424 million deal keeps Americans launching to the International Space Station aboard the Soyuz through 2016, with return and rescue services extending until June 2017. "Even this delayed availability will be in question if Congress does not fully support the President's fiscal year 2014 request for our Commercial Crew Program, forcing us once again to extend our contract with the Russians," Bolden wrote in a blog post Tuesday. NASA is encouraging the development of private American spaceships to fill the cargo- and crew-carrying void left by the 2011 retirement of the agency's iconic space shuttle fleet. NASA signed billion-dollar deals with two companies — California-based SpaceX and Orbital Sciences Corp., which is headquarted in Virginia — to fly unmanned supply missions to the space station. SpaceX has already completed two of its contracted 12 missions using its Dragon capsule and Falcon 9 rocket. Orbital successfully test-flew its Antares rocket for the first time last month and aims to launch a demonstration mission to the orbiting lab with Antares and its Cygnus spacecraft in the next few months. But things are progressing more slowly on the crew-carrying side. NASA had hoped that at least one homegrown private spaceship would be ready to carry astronauts by 2015, but the timeline has slipped because Congress failed to fund commercial crew at the level President Barack Obama requested, Bolden said. "If NASA had received the President's requested funding for this plan, we would not have been forced to recently sign a new contract with Roscosmos [the Russian Federal Space Agency] for Soyuz transportation flights," Bolden wrote. Bolden isn't alone in prodding Congress to approve the full $821 million for commercial crew in President Obama's fiscal year 2014 budget request, which was released last month. "We strongly urge Congress to provide the necessary appropriations to keep the program on schedule," Commercial Spaceflight Federation president Michael Lopez-Alegria, a former NASA astronaut, said in a statement. "In difficult economic times, extending the offshoring of American jobs to Russian rocket companies is not a practice the American taxpayers should support." The three leading private contenders to fly NASA astronauts to and from the space station are SpaceX, aerospace giant Boeing and Colorado-based Sierra Nevada Corp.
SpaceX is developing a manned version of its Dragon capsule. 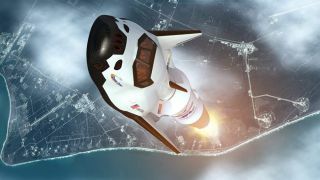 Boeing is working on a capsule of its own, called the CST-100, while Sierra Nevada is building a space plane called Dream Chaser.